Which steps will you take? What order will you take them in? What will be the pattern of your story? This weekend, I spent some time planning out two different projects: the next stage of Starwalker, and Tales from the Screw Loose, which I haven’t started writing yet. I don’t plan my writing very often. Those who know how I plan, know that I don’t plan very deeply, either. I’m not truly a planner or a pantser; I’m an ad-hoc adventurer with a barely-legible roadmap. A guest at one of my writing group meetings back in the UK described her planning/writing process as ‘stepping stones’. As it turns out, this is the process that works best for me. There are probably other names for this type of system. Skeleton. Outline. But I enjoy the stepping stones analogy, so I’m sticking with it. Imagine that your story charts the path from one riverbank to the other. You could describe each and every inch of the path before you take it, and know exactly where you’re going before you leave the riverbank. You could wade in and see what happens. 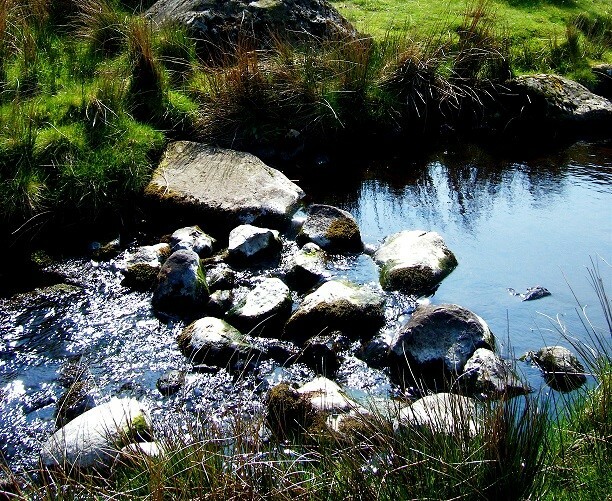 Or, you can identify some stepping stones to aim for, and find your way between them. That’s how I plan. I have stepping stones that I know I want my story to land on, and my characters determine the path between those points. I discover the story as I go, but I always know where it’s headed, even if it’s just the next stepping stone. Those stones vary widely in size. Sometimes, I’ll have a specific scene mapped out in my head, in incredible detail. Sometimes, it’s just an idea of an event, or a particular psychological corner that a character has to turn. Or sometimes it’s a single image, a snapshot or a concept, or even just a parting glance of the end of something. The lead-up to these stones is always something I discover on the way, as I balance the characters and their choices, the roadblocks in their way, and the goal that is rolling around in the back of my brain. Sometimes it takes some wrangling to get the outcome that I’m after – all the way to that next stone – and sometimes I end up taking a path I never anticipated, but it usually works out. The characters are always my greatest guide through the stories. I write heavily from a character’s perspective (even when I write in third person, which I do outside of the web serials), and staying true to what those characters would say or do is important to me. Their path has to make sense, and they soon let me know if they’re going to take the easy path to that next stone, or if they’re going to make me work for it. Whether it’s throwing a help or a hindrance their way, I seldom find that there’s no way to get to where I want the story to be. 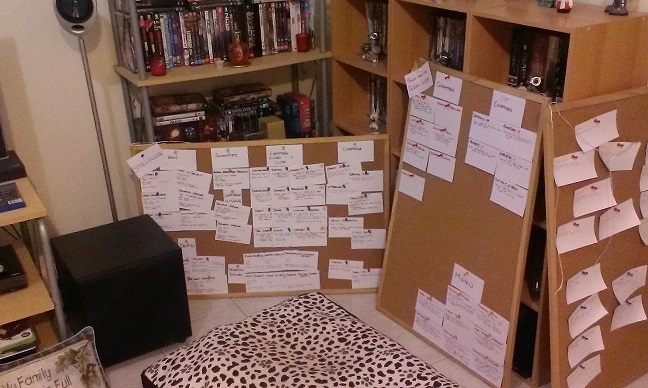 As for how this stepping stone method of planning takes shape in a practical, physical sense, I love using pinboards and notecards. My original plan for Starwalker was a series of 12 notecards, and they carried me through all 3 books so far (three and a half years’ worth of writing!). Just 12 notecards; that was all I needed! Over the weekend, I got my stock of blank notecards and glittery-inked pens out, and freed my pinboards from their exile against the wall. And then I went a bit nuts. I colour-coded stuff. I grouped the cards into sections: characters, chapters, different sections of characters, milieu notes, etc. Only the notecards under ‘chapters’ actually made up the stepping stone plan for the story, but the rest is useful for reference. It helps me to make it all visible. For Starwalker, I filed my original 12 chapter notecards under ‘done’ and reorganised the character lists so that I know who’s currently part of the crew and who’s ‘dead’ or ‘captured/missing’. Then I started adding more cards: 3 more chapter notecards and a chunk of new characters that my intrepid crew will meet in the course of their next adventure. I’m not quite done there yet, but the ball is rolling. Ideas trickle against each other. The notecards have gaps; for example, none of the new characters have names yet, but the important characteristics are down. The space station still needs a name. Likewise with Screw Loose: I have a pinboard with the bones pinned to it, but there are lots of gaps I need to fill. Characters I know I need to define before I start. The chapter list needs more stepping stones in it, and doesn’t have a particular order or flow yet. I can see the size of the work I have to do before I can truly start writing it, though, and that’s powerful. It’s more than I knew yesterday. I’m starting to see the shape of the story and pick out the important highlights. I mean, a story about a robot brothel is all well and (raunchy-)good, but I’d like there to be a plot, too. Now, I know what I need to do to be ready. Stepping stones are a great way to allow yourself freedom and exploration in your story. Visualising it is a good way to look at the shape of your story and see what gaps you might have, and what you might need to do before you start. Together, they arm me for my adventures. I know all the tools I have in my backpack and I have a vague map to point me in the right direction. I set off surrounded by characters whose voices I know well enough to let them guide me, and a compass to keep us all true as we explore the story. I’m standing at the edge of the river, toeing the water and eyeing that distant bank. Soon, I’ll be donning my hiking boots and striding out into it all. I can’t wait. Here they are: my planning pinboards!